Online news media are reporting about a “near-miss” occurrence in which two Boeing 747 aircraft supposedly came with 100 feet of each other over Scotland. ASN reports about the details as reported by the UK Airprox Board, details that were ommitted in most of the news articles. On June 23, 2013, two Boeing 747 passenger planes were overhead Scotland on a course to cross the Atlantic. At 12:50 UTC, Lufthansa flight DLH418, a Boeing 747-800, requested a climb from FL320 to FL340. The Monstrose sector controller at Prestwick Centre at 12:51:45 instructed the flight to climb to FL340. 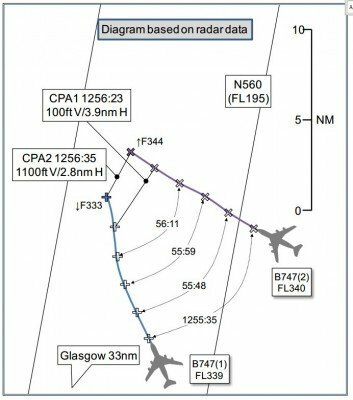 At 12:52:00, the pilot of British Airways flight BAW87, a Boeing 747-400, contacted the Montrose sector maintaining FL340 (indicating FL339). The two aircraft were 24.3nm apart on converging tracks. At 12:55:22, a low-level Short Term Conflict Alert (STCA) was triggered as the two aircraft were 9.8nm apart. Just prior to this, the controller had realised that the two aircraft were in confliction; however, he was unable to issue instructions due to another flight transmitting on the frequency. At the end of this transmission the controller transmitted, “avoiding action [BA87] turn left immediately heading two seven zero degrees, traffic in your right one o’clock.” The pilot of BA87 read back, “two seven zero [BA87]”. Avoiding action was then passed to the Lufthansa pilot, “[LH418] avoiding action turn right immediately heading zero five zero degrees traffic in your left eleven o’clock”. The Lufthansa pilot replied using his call sign digits only. At 12:56:12, the controller transmitted to the British Airways flight, “[BA87] avoiding action turn left immediately heading two six zero degrees traffic in your right one o’clock”. The British Airways pilot replied “two six zero with traffic in sight [BA87]”. The controller was aware that he had not received a full readback but was concerned that the crew’s workload was high and did not want to distract them further. At 12:56:17, high-level STCA alerted as separation was lost: the distance between the Boeing 747s had reduced to 4.9nm with both aircraft at FL340 on converging tracks. The BA flight appeared to have turned slightly right. By this time another controller had arrived on the sector to provide assistance and suggested that the first controller give vertical instructions. At 12:56:20, the controller instructed BA87 to “descend now immediately”. The Lufthansa pilot reported “resolution advisory in the climb”. This was acknowledged by the controller. Separation between the two aircraft reduced to 3.5nm/300ft. At 12:56:37, vertical separation between the two aircraft was regained as BA87 was at FL332 and LH418 was climbing through FL344. The lateral distance was 2.8nm with the tracks of the two aircraft not appearing to have changed significantly. In considering the cause of the Airprox, the Board agreed that there were two issues involved; namely the actions of both the controller and the pilots. There was a prolonged discussion as to whether the controller’s actions were part of the cause or were a contributory factor. Bearing in mind that his subsequent recovery actions, if taken, would have resolved the confliction, it was decided that they were a contributory factor. The Board considered that the pilots’ actions, by flying each other’s avoiding action ATC instructions, caused the Airprox. As to the risk, because [BA87] had [LH418] in sight as it was turning towards it, and both ac reacted to TCAS RAs thereby establishing standard vertical separation by a horizontal distance of 2.8nm, the Board opined that there was no risk of a collision.